A Glaswegian of Highland and Irish descent, his lifetime involvement in song, ballad and poetry is reflected in his singing, collecting and songwriting. His early years as a radio and television technician and later as a Modern Studies teacher, coupled to his passion for the outdoors have in diverse ways fueled and complemented his central interest in folk music. He has an extensive repertoire and has sung at clubs and festivals in most corners of Britain and Ireland and more recently in the USA. It's strange to think back to a time on the Scottish folk scene when... er... there actually wasn't a scene as we know it now. Comparing what we call the 'scene' today with the situation fifty years ago, say, is almost like talking about two different countries... In one, there was only the first green shoots of the Revival appearing through the lank undergrowth of what was often called 'folk' - songs like The Scottish Soldier, or worse... There was Hamish Henderson's first 'People's Ceilidh' in 1951, and there was music from the likes of Jimmy Shand; this is often now derided, unfairly, since it kept fine tunes being heard, enjoyed and danced to. In that other 'country' - the here and now - we find numerous traditional bands, festivals abounding, Gaelic music being regularly played, high quality recordings, you name it. There are things happening that would have amazed the pioneers, some of them, sadly, gone from us. We owe all of them much for their enthusiasm and commitment. One of these people (happily still around!) is singer Geordie McIntyre. Now living in Dunblane, he's originally from Govanhill in Glasgow, with a family over several generations from the Gorbals, Argyll and County Antrim. He was raised in a Scotland where recorded traditional songs were effectively unobtainable. Nor were there many to be heard on radio; granted, that would have been of little moment in his formative years anyway, as there wasn't electricity in his home initially. "That's right", he says, "I was born in 1937 and we didn't have electricity till I was eleven. We hadn't even an accumulator radio. We were almost the last household in Glasgow still relying on gas. When the electric came, my grandfather bought a radiogram and records... Not Scottish, but white Gospel, like Tennessee Ernie Ford. That wasn't surprising: he was a postman, but also an evangelical preacher. He sang only religious songs, never secular ones. Even when he was a World War One POW, there he was in the camp playing violin, melodeon and concertina to accompany hymns! He and my grandmother and my mother brought me up. She never married, and she was - I now realise - an incredibly courageous woman. Anyway, I heard nothing traditional at home, except maybe at Hogmanay, and street chants at school. I liked Tennessee Ernie Ford and the Al Jolson records my mother bought me... Very muscular singing, passionate, I like that style still". He left school at fifteen. His schooling, he recalls, was 'abysmal'; because of this, he hadn't the qualifications for the job he really wanted, telephone engineering. He settled for being a radio repair apprentice instead. One reason for being a telephone engineer, he explains, was to escape the city, its tenements and streets. He'd felt the call of the wild places and wasn't unusual in that; during the Fifties and early Sixties climbing clubs like the famous Craig Dhu were being formed, and half of industrial Scotland (it sometimes felt) would be in the Cairngorms and Glencoe at weekends. It was that yearning for the remote and lonely - with him still, and the inspiration for songs of his like Inveroran - which helped to get him into traditional music. "I'd go cycling, I'd flee to the countryside, stay in youth hostels. I'd go with pals or alone, and we'd hear songs around the campfire, Mairi's Wedding, lots of American hobo songs... Yet what most affected me was one night hearing The Barnyards Of Delgaty. A fellow called Archie sang it, we'd just run up Ben Ledi (we could then!) and 'though I couldn't understand most of it, I thought it was fantastic, the word pattern and the tune. OK, I was hearing other stuff I liked like skiffle and jazz, but nothing like this. I heard Buddy Holly, and some (obscene!) soldiers' songs on National Service, but it was The Barnyards that really got me". A chance encounter with a young woman in Killin Youth Hostel then opened up whole new vistas for him. She'd invited him to a party in Glasgow, telling him to bring his guitar ("a wee Spanish thing") and to sing. The 'party' proved to be a meeting of Glasgow Folk Song Club (GFSC). "Well", he recalls, "that was it, me before a microphone for the first time ever: I never looked back". He found himself in an amazing world. "My early 'twenties were incredibly exciting. The music was so inclusive, for a start. And people just learned as they went along. That was difficult sometimes. I had a great instinct to find out about songs, but the only collections available were the 'Burl Ives Songbook' and the very important 1951 'Rebel Ceilidh Songbook'. This was full of great stuff, including from Hamish. But it had no tunes, you had to learn them by listening to other people singing... There existed Ewan McColl's 1954 'Scotland Sings', but we hadn't got that... To me, the most impressive singer then was Ewan McVicar, not least because he sang unaccompanied. I didn't quite realise you could actually do that..."
Already, a semi-commercial side to the music was developing. GFSC itself was booking paid acts like Mary O'Hara and Dominic Behan. "Equally, though, traditional singers like Davie Stewart and Flora McNeill were coming forward. Hamish was at the School of Scottish Studies - he was always very encouraging to me - and we set up a Folksong Workshop, influenced by the Singers' Club in London. This was near the Mitchell Library. It had fellow organisers and fine musicians Bobby Campbell and Gordon McCulloch. There were debates between those called 'purists' (I was never one) and those who saw some commercial openings. We had people like Louis Killen and Johnny Reavey from Tyneside, and Joe Heaney (then living in Clydebank) as a resident singer. We had Pat McNulty, he was the only uilleann piper in Scotland, 1963. Fiddlers were very rare; one, Simpson Pirie, I remember... We had Luke Kelly before The Dubliners even existed, and our repertoire was traditional, Scottish Republican songs (and Irish ones, until the Troubles), anti-Polaris songs, everything. It was an incredibly exciting time". The club lasted about three years, to be succeeded by Folksong and Ballad; modelled on the Singers' Club, too, that was seen by some as elitist, a charge that Geordie, one of its four organisers, refutes. It ran weekly at a hotel with a three-week gap in the summer, and attracted audiences averaging forty people, or more for guests like Ewan McColl. Other guests included Jeannie Robertson, Scots piper Norman McLean and Flora McNeill - "giving the first- ever performance to a non-Gaelic audience". There were shanties, Mummers plays, songs from throughout Britain, even a concert by singers from Italy's Po Valley. But eventually, the club ran out of steam and the venue was later demolished. "Yes, my educational deficiencies...I wanted to learn more about the historical context of the songs I sang, but didn't know how. So I began studying again, English and History. I suppose you could say that it was through folksong that I got into education and then teaching, because I went on to Strathclyde University and Jordanhill College for teacher training. This took all I had, so I dropped out of singing mostly, apart from organising the odd concert, writing sleeve notes (for Belle Stewart's album) producing the odd record, like for The Clutha and Topic's 'Streets of Glasgow'; incidentally, that one gives a good idea of the sort of Glasgow music around in 1973. My domestic life was changing, too, and what with driving a laundry van in summer and erecting aerials on roofs, I had little time for music". Once qualified, he taught History and Modern Studies, mostly the latter, in two Glasgow schools. He was at one, Castlemilk, for eighteen years. "Castlemilk was tough, but I got through to the kids with songs, often. If we were discussing a topic like 'Changing Glasgow' for example, I'd make it more relevant by singing something like Adam McNaughtan's Where Is The Glasgow? Doing this brought me a lucky break: one pupil, his dad was a BBC radio producer, a remarkable Christian Socialist called Donald MacDonald from South Uist. He had a programme, 'Crossfire', tackling contemporary issues. He invited me to contribute a song for each topic. A really demanding one was mental illness. There weren't any appropriate songs so I had to write one. My daughter from my first marriage was a psychiatric nurse, she helped me, oh but it was hard! Donald worked for Religious Broadcasting, but the programmes weren't religious themselves... I'm not religious, incidentally. My grandfather never pushed religion at me, he was hugely tolerant. I just haven't got that magical thing called 'faith'... But I enjoyed writing those songs, although working to order isn't me, I sort of write in spasms". "The songs that interested me were (and still are) narrative ones, particularly ballads. I once met a descendent of the poet Robert Tannahill, Andrew, it was through fixing his telly! His rooms had books from floor to ceiling. This was before I'd attended uni, I'd never seen anything like it. He was phenomenally knowledgeable about Scottish literature. He introduced me to Grassic Gibbon's works and he gave me books, I still have those copies of Tannahill's poems on my shelves. Through him I came to interview Arthur Lochhead, eventually lodging the tapes with the School of Scottish Studies. Arthur was then in his seventies. He'd been raised by an elderly aunt, whose own songs had been collected by William Motherwell in the mid-nineteenth century. I was so lucky, there were still singers around then old enough to have that continuity". He speculates on how much his passion for the origins of songs stems from his own upbringing. "From the songs, you get this incredible historical sense... Perhaps it's my own psychology here. Because I never knew my father, and had no siblings - . 'though I was brought up with much love - I wonder if through song I'm searching for my own roots? Songs, I think, have given me roots, they've been absolutely central to my life. I feel privileged and grateful for that". Relative absence from the folk scene in the Eighties did him little harm, he feels. He went to the occasional festival, but only as a visitor, not as a guest. "New groups were appearing, the music was being disseminated more widely in society, this was good. At Girvan Festival, back in the 1960s, I met Billy Connolly and I recently became more aware how many people like him were still around, singer-comedians, who, if music halls' had still been operating, would have been on those stages. With festivals, and I'm slightly simplifying, you had people who could just get up and do a turn. Folk clubs were similar. It's worth remembering that whilst struggling now, clubs were the bedrock of the Revival". In the Eighties, his second wife Catherine became seriously ill, enduring numerous painful operations over several years. Often, he'd just wander the hills for solace: they, like the songs, readily provided him with that. 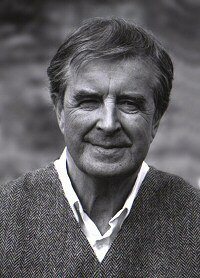 He was finding a new interest, ecology, having been led into it by writer Helen Fullerton whom he'd first met in the Sixties. "She produced a book of poems, 'My Country', in the Eighties. My own Inveroran dates from this period, when Catherine finally died. That was 1989. Inveroran, the place, gave a lot to me then". But life wasn't all sadness nor the loneliness of the hills. He threw himself into organising a ceilidh for Hamish Henderson's seventieth birthday in 1989. 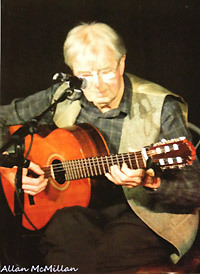 He likewise organised a concert to commemorate the fiftieth anniversary of the Spanish Civil War, featuring The Whistlebinkies, Carlos Aredondo and others. "Hamish read a poem at it - and he also brought along Alison McMorland, whom I'd known from a few years before. She'd stayed with Catherine some years back. She was writing a book on Willie Scott and was living in York at the time. Anyway, she was experiencing a bad patch herself: so, two of us bruised in different ways... It was a sort of miracle that we should meet again, and well, we sort of got together, and later married... She's been immensely encouraging to me. Now, we sing together, 'though really we're both solo singers. Songs of all sorts give us pleasure. They don't have to be old, we're not antiquarians, we're not into that. A song is good because it's good, not merely because it's old". He thinks a lot about songs and singing. "For a start, I'm so inspired by some of the new songs, often from younger musicians, like Karine Polwart, just smashing. And not just in the Scots tradition, American, Irish and English, too. But some contemporary writing is thirled to a 'transatlantic English' orientation, that does nothing for me. Then there's over-accompaniment: music should serve text, not vice- versa. The 'wrap round' accompaniments of the Seventies were the worst for that. You just can't do a big ballad to saxophones and bongos - or at least if you do, it's still got to be judged by its merit not by its apparent cleverness. If it's no good, it'll be filtered out. Good songs are usually strong enough to survive; and naturally, you can put new tunes to songs, singers always have. There's always scope for interpretation, there's not just one way to do Tullochgorum, say, or Roisin Dhubh. But there has to be respect involved. People who are ignorant - I mean that kindly - say 'Oh, a folksong's just a folksong!' They don't know how to respect it. You have to learn how. This isn't Country, formulaic with a single simple idea; that's alright to half hear in a crowded bar. People who appreciate a good song are expected to listen. You can't half listen to The Rocks Of Bawn, for instance." Many of today's young singers impress him. He especially likes those who clearly acknowledge what's gone before them, shown by the way they use language and approach a piece - "the ones who can work a skeleton tune to work a text, I want to hear that in young singers as in older ones. They've got to work to find their voice, which could take years". Time has to be taken to get a song right. You go through the stages of learning the words and singing them, but that doesn't necessarily mean you're singing the song yet. That only comes with emotional investment in it. The more you get into songs the more you feel part of something beyond yourself: it completely demolishes ego! Because with singers there's nothing between them and the people they're communicating with, singers are vulnerable creatures. That can't be overstated. You can enhance a song by instrumentation, but ultimately you stand or fall by the voice". This isn't just a question of technique, he argues. "It's about approach, and what you want from a song. If you have to sing for a living, then issues of technique, like projection, become more salient. I wouldn't want to just sing for a living, that's a different challenge. Better to be like Bert Lloyd, singer/multi-linguist/writer/historian, that's a good balance. I think there are actually two voices, public and private. Some are private only, like Lucy Stewart who never sang outside the home, but only across her kitchen table, unlike her contemporary Jeannie Robertson. Keeping a song fresh can be difficult. It's partly down to whether you 'sing for your own amusement or for your own amazement', in Sam Ramsey's phrase. He said if you sing for your own amazement you'll keep it fresh as you grow into it, and you'll be continually surprised. I like that idea". "I'm very optimistic about song, things are very healthy indeed. Songs are so important in life. What the great singers like Paddy Tunney and Joe Heaney had, unquestionably, was their pride. They were so proud to be part of something of real substance. What folksong can do in this soul-less, technological age is to give people a sense of their past and their worth. They can feel their own family roots, that's fine, but they can also get a sense of being rooted in a far wider cultural sense - that's what song does".